Communicating Common Core State Standards (CCSS) is becoming a major issue in most school systems across the U.S. NSPRA launched our Common Core Communication Network (http://www.nspra.org/commoncore/index/) in May 2013 to help education leaders everywhere see examples of how others are communicating about CCSS. 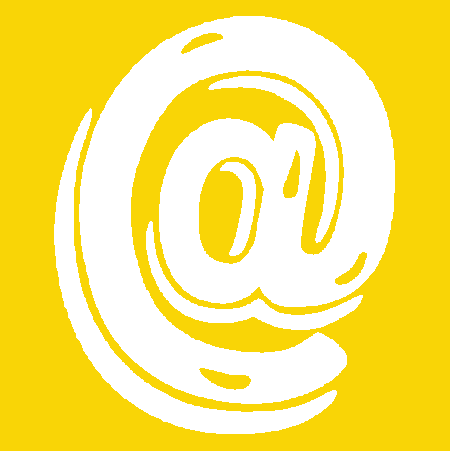 The network also provides insight to NSPRA members and the organization itself on how to communicate more effectively about the implementation of CCSS. Push-back on CCSS is getting a bit stronger in some states and Common Core itself has become more of a national political issue in some pockets of the U.S. Districts that proactively engaged staff, parents and their communities are finding little resistance to their CCSS efforts. Unfortunately, the leadership behind CCSS never got out in front to communicate and engage key audiences about the standards. (MEW note: No kidding. It only bypassed all state legislatures, taxpayers, voters and school boards). So now others, as predicted by NSPRA, are attempting to define what CCSS is and these critics are turning it into a messy and misinformed political football being tossed at local school district leaders. (MEW note: The CCSS proponents only wish the opponents are misinformed and that it is political in nature. Read on for more public relations rhetoric here). Jim Dunn, APR, past NSPRA President, is currently president of Jim Dunn Associates, based in Liberty, Missouri. Jim has served as a high school English teacher, a professional school communicator, a college ad hoc faculty member and a communication consultant. He currently works with the Missouri Public Schools Advocates, and local school districts in addition to serving as NSPRA’s senior Common Core consultant. Description: A group concerned with the national government having a say in their Missouri education opposes the Common Core, calling it a “thinly veiled initiative… designed to circumvent the prohibition of national education standards.” The group has two stated goals. 1. 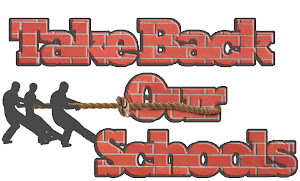 Take control of education out of DC and private corporation's hands and return it to our local communities, and 2. Protect our children's privacy by restricting government's ability to collect and share information about them. That's a factual statement from MCACC. If NSPRA thinks DC and private corporations are constitutionally empowered to direct/develop educational standards, then it should specifically show where this power of federal control of education development can be handed over to public/private partnerships. This research on the authority of CCSS being handed to a public/private partnership doesn't sound "misinformed and political" to me. Mr. Dunn has developed a counter point sheet to opponents' arguments. MEW editors, assisted by Jane Robbins of American Principles Project, have provided researched and factual based answers to NSPRA's and Mr. Dunn's counterpoints. We respectfully request that NSPRA and/or Mr. Dunn advise us of any erroneous facts/research we have provided in response to their counterpoints to our original statements. (Critic's points are grassroots groups, counter-points are Mr. Dunn's, the latest response is from MEW with APP assistance). Critic’s Point: Common Core will allow the government access to our children’s unique identifying information. This information, once collected, might be sold to be used by others (marketing and sales companies) for who knows what? A Counter-Point: Common Core opponents are creating unfounded fears around the sharing of student information. Proponents claim shared information will be general that helps school districts better support a child’s learning; and NONE will be sold for any reason. The connection with Common Core is this: The Smarter Balanced Assessment Consortium has a Cooperative Agreement with the U.S. Department of Education (USED) that requires SBAC to allow USED access “on an ongoing basis” to any “student-level” (not aggregate) data it receives on Missouri students. So any data that SBAC gets from the testing (which supposedly will begin in 2014) will go to the federal government. And last year USED gutted federal student-privacy law, so that any personally identifiable student data it receives can be shared with literally anyone in the world – Department of Labor, Health and Human Services, even commercial companies – as long as USED uses the right language to justify the sharing. If DESE really has no intention of sharing personal student data with USED (which will not be the case beginning in 2014), it should welcome state legislation that strictly limits the data it can collect and share. A state statute will fortify DESE in its resistance to USED’s increasingly aggressive demands for data. Critic’s Point: Members of the Common Core Validation Committee didn’t agree with it and didn’t sign off on it. That’s a sign that this is a bad idea and states should reconsider accepting it. A Counter-Point: Just because someone has a different opinion doesn’t mean that it’s a bad idea. The majority of leaders on the Validation Committee DID agree with it, which is what got us to this point in its adoption. There were certainly members of the Validation Committee who signed off on the Standards. But the members who were the most qualified to weigh in – the leading English language arts standards expert in the nation (Dr. Sandra Stotsky) and the only one who holds an advanced degree in mathematics (Dr. James Milgram) – refused to endorse the Standards. The issue is quality, not quantity. Critic’s Point: We can’t fund implementing the Common Core in a way that will truly benefit students. A Counter-Point: Even with tight budgets, money could be found or reallocated for Common Core purposes. CCSS implementation is less than one percent of the $500 billion spent on education right now. In the first place, where is the documentation for this “one percent” figure? Missourians are weary of the continual unsupported claims of Common Core proponents, and this is another good example. In the second place, this “money could be found” response is a classic big-government, bureaucratic answer to the problem of limited taxpayer money. If the “experts” want it, the taxpayers must be forced to pay for it, for their own good. Common Core implementation – particularly the technology needed to administer the Standards-aligned tests – could be ruinously expensive. Missouri, like most other states, signed onto Common Core without performing a cost analysis for the implementation. Taxpayers deserve a detailed explanation of what the costs will be, and how they will be paid for. They are still waiting for this information. Critic’s Point: The standards we have now are fine. America is doing okay in education. The Fordham Institute is the lobbyist for Common Core, having been paid $6 million by the Gates Foundation for that purpose. So everything Mr. Petrilli says about Common Core can be safely discounted. Even if we take his claims seriously, they are unsupportable. The “math facts” students are expected to know include confusing, “alternative” ways of working problems, and experimental geometry. The Standards mention the founding documents but don’t explain why they should be taught by English teachers, who are not trained to teach the background, context, and philosophy of the documents. The “evaluate evidence and come to independent judgments” piece is, in the context of Common Core, related primarily to the belief that that there are no right answers that students should have to know. More importantly, Mr. Petrilli fails to explain why all these supposed benefits of Common Core could not be achieved on the state level. Why can’t Missouri create its own standards that include these elements? Why does it have to relinquish its autonomy over standards to private associations, and to California and New York? Mr. Petrilli himself admits that a quarter of the states had standards equal or superior to Common Core. Why couldn’t Missouri model its standards on those, rather than settle for the mediocrity of Common Core? The implication that only Common Core can fix what’s wrong with education is utterly unsupported, and contrary to common sense. Critic’s Point: We already know the Common Core State Standards won’t work because No Child Left Behind (NCLB) didn’t work. There will still be gaps in what students learn from place to place. A Counter-Point: The Common Core State Standards are not the same thing as NCLB. For example, NCLB did not address education between states and was short-sighted in responding to the unique challenges students with special needs or students learning English as a second language would have in achieving at the same level as a traditional student. The Common Core’s ultimate goal is to prepare all students for success in college or in their career, whereas under NCLB, each state had its own goal which varied widely. Although the Common Core does not solve some of the ills in today’s education, it is a step in the right direction and is an improvement to many of today’s education practices. Common Core doesn’t address the “unique challenges” of certain students any more than NCLB did. Indeed, it aims to test all student populations through the federally funded assessments. With respect to the “success in college or career” claim, one drafter of the Common Core math standards admitted in a public meeting that the “college” referred to is a nonselective community college, not a selective four-year university. The philosophy of Common Core is that students should be trained to be workers, not truly educated as citizen-leaders and human beings. If Missourians want to settle for this, they should do so through their own standards, developed in Missouri by Missourians. Critic’s Point: New testing expectations for the Common Core will confuse educators and students since they are so different from what we expect now. A Counter-Point: Although the tests will be different, it is better to get the ball rolling than to lose even more time waiting for the right moment. There won’t be one. The best thing to do is to go ahead and take what you learn to make it better. Many educators believe that success should be measured in a variety of ways, not just in one standardized test. The results of the tests that will be implemented in this first trial of the Common Core should not be the “be-all-and-end-all” of determining whether learning is taking place in a meaningful way through the new standards. The Smarter Balanced assessments will certainly be “different” – computer-adaptive products that are enormously expensive, that will allow all manner of data-collection on our students’ test-taking attitudes and behaviors, and that will (in many aspects) be subjectively scored. The argument that it’s “better” to forge ahead with this untried, unproven approach suggests the question . . . better than what? Apparently the proponents are comfortable with the idea of experimenting on all Missouri children for a few years and then discarding the results if things get too bad. Another concern with the Smarter Balanced assessments is that teacher evaluations will be tied to the test scores. Especially when 1) the technology requirements of Smarter Balanced will necessitate a lengthy testing window, thus allowing some students much more instruction time before testing than others; and 2) the scoring will be in many aspects subjective, it is hardly fair to teachers to put their careers on the line just to meet an arbitrary deadline for an experimental assessment. Critic’s Point: The Common Core State Standards are an experiment we are subjecting our children to without parents being able to give informed consent. A Counter-Point: Educational standards vary drastically from community to community as it stands now, and they all change based on new information and new practices. This reform is another example of that, based on 20 years of good research, field testing, efficacy testing and best practices for education. To improve, we need to change. To the extent this argument is even comprehensible, it is utterly unsupported. What research? What field-testing? What efficacy testing? What “best practices”? Missourians deserve hard facts, not unsupported claims. “To improve, we need to change.” But change doesn’t necessarily mean improvement. Many changes, including those in education, have resulted in disasters. Common Core proponents have offered no evidence that a change to the Standards will result in improvement. Contrary evidence is often ignored, especially when “consensus” is used to override it. Significantly, the proponents don’t even try to address the central “Critic’s Point” above – that Common Core is an experiment conducted on children without informed parental consent. Of course it is, and there is no good response – only the implication that parents should defer to the experts, who after all know what they’re doing. Critic’s Point: Local control is taken away from educators, local officials, and parents in terms of defining success and the curriculum through the Common Core State Standards. A Counter-Point: During the inception of the Common Core State Standards, the general public was given a chance to comment on them, and they did. The website for the Common Core State Standards received more than 10,000 comments as feedback to the draft version of the movement. Educators nationwide overwhelmingly support the Common Core with 77 percent of educators in favor of it. Parents like it too (70%) and among people who have educated themselves on the standards, they are not concerned with what the standards require of their local education programs. Posting a set of incomprehensible standards on an obscure website that practically no one ever heard of can hardly be considered meaningful opportunity for public comment. And Common Core creators Achieve, NGA, and CCSSO have never released any comments about or critiques of the drafts. The sources of those critiques, and whether any of the suggestions were adopted (and if not, why not), have never been revealed. The entire Common Core effort was shrouded in secrecy, for obvious reasons – to prevent the delay (and perhaps derailment) that would inevitably result from giving the public a real voice. Incidentally, there are over 55 million K-12 students in the U. S. This means there are approximately 110 million parents of K-12 students. There are also approximately 3.2 million K-12 teachers in the U.S. Receiving “comments” from 10,000 out of over 113 million interested parties hardly demonstrates broad public awareness of what was happening with Common Core. Critic’s Point: The CCSS have been copyrighted by the groups that spearheaded them, the National Governors Association and the Council for Chief State School Officers, so local educators don’t have the ability to change them if they aren’t working in their area. A Counter-Point: The standards are designed to be tweaked and refined in order to best educate all American students. These groups invited discourse and collaboration in creating the standards. It stands to reason that they will continue to listen as changes are suggested. Also, standards are separate from curriculum. The standards simply provide a framework in which local educators should work, but how they educate their students is completely up to them. This response essentially admits a central problem with the Common Core Standards – that Missouri cannot change the Standards on its own. 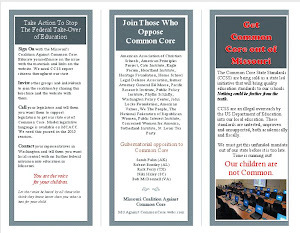 Missouri parents or teachers who see that Common Core’s experimental geometry approach, for example, isn’t working in the classroom are not likely to be satisfied with the empty assurance that “it stands to reason that [the Standards owners] will continue to listen as changes are suggested.” Missourians deserve to know the identities of the people they can contact if changes need to be made – and that those people are in Missouri and are accountable to them, not to powerful private funders and the federal government. The claim that “how [local districts] educate their students is completely up to them” is untrue. As former US Department of Education (USED) general counsel Kent Talbert and Robert Eitel have documented, curriculum inevitably follows from standards. That’s the point of standards. From Talbert and Eitel’s report: “[T]hese standards and assessments will ultimately direct the course of elementary and secondary study in most states across the nation, running the risk that states will become little more than administrative agents for a nationalized K-12 program of instruction and raising a fundamental question about whether the Department if exceeding its statutory boundaries.” States and local districts’ “flexibility” will be reduced to choosing one Common Core-aligned textbook over another Common Core-aligned textbook. In addition, the two testing consortia funded by the federal government are using the money, explicitly, to “develop curriculum frameworks” and “develop instructional models.” And what is on the national test will control what is taught in the classroom – especially when the teachers’ evaluations are tied to the test scores. The claim that the national Standards “do not dictate how teachers should teach” is, in many respects, false. An English teacher who spends 80 percent of her time teaching great literature may not continue to do so, but must substitute a large chunk of nonfiction texts. A geometry teacher who uses the traditional Euclidean method must now teach Common Core’s experimental approach instead. A first-grade teacher who teaches the standard algorithm for addition and subtraction is forced to use alternative “fuzzy math” approaches. In these and many other areas, the Standards dictate the methods. Critic’s Point: The Obama administration has had some flaws. They should not be entrusted to teach our youth. A Counter-Point: This isn’t a federal program. It is supported in part federally, through financial incentives for states that adopted it, but the federal government is not, and has never been, in charge of it. Beyond the amusing description of the Obama Administration as having “had some flaws,” this argument is highly misleading. USED was deeply involved in persuading states to sign onto Common Core through the Stimulus bill, which included a general commitment to “college- and career-ready standards” and specific commitments in the Race to the Top program. A state that refused to adopt Common Core and the aligned assessment lost 70 points in the Race to the Top competition (out of 485 possible points). This meant the state had no hope of compiling enough points to receive a grant (and in fact, no state was awarded a grant without adopting Common Core and the national test). If the Common Core proponents were honest, they would admit that they never could have convinced enough states to sign onto the national standards without the federal “persuasion.” And USED made it clear that, upon submitting their Race to the Top applications, the states were expected to implement the Standards regardless of whether they were awarded money. Finally, the USED reinforced the desirability of retaining the Standards by linking No Child Left Behind waivers to their implementation. So states have kept the Standards to increase their chances for more federal favors. A Counter-Point: Although there was little discussion about Common Core in the beginning, it is now a hot-button topic of debate, despite people still not knowing much about it. Nearly 80 percent of educators, those who have become the most well-versed in it since it directly impacts their jobs, support it. The proponents apparently consider it acceptable to delay debate until after a controversial policy is in place. Most Missourians would probably disagree. And once again, where does this 80% figure come from? And is it 80% of educators who feel free to offer an honest opinion about the Standards, or only of those who realize that their jobs may depend on toeing the party line? Critic’s Point: Supporting the Common Core allowed states access to federal funds from Race to the Top and waivers from the federal No Child Left Behind Act. If it isn’t a federal program, why is the federal government getting into it? A Counter-Point: The federal government has a long history of incentivizing the programs it believes in, regardless of whether or not it is directly involved in the program’s implementation. Just because the government supports it through incentives doesn’t mean that it has a say in it. See previous response about federal involvement. Remember also that the U.S. Department of Education is funding the Common Core-aligned tests -- and whoever pays for the test will control what’s on it. Indeed, the Department has established a “technical review” process that potentially gives the Department even more control. And what’s on the test will dictate what’s taught in the classroom. See how this works? Critic’s Point: The Common Core is tied to high-stakes testing meant to measure student achievement and teacher success. Now that Common Core supporters are concerned that the measurement tools are not ready, they don’t want the outcomes from the Common Core experiment to count. Isn’t this just trying to get away from accountability? A Counter-Point: In order to get a true read from any assessment, a measurement tool must be both reliable and valid. The tests that have been designed have not been reviewed enough to ensure that they meet either criterion. Thus, they must be tweaked and analyzed to be sure that they are measuring what they are intended to measure. Once the tool is refined, its feedback will be taken into account. Until then, we should focus on getting the kinks out of this new program without the added pressure of attempting to “teach to a test” that doesn’t measure success for teachers or students. This counter-point seems to conflict with the previous argument that we have to plow ahead with the experimental tests before more time is wasted. Finally, though the word “outcomes” is rarely seen in this debate, it provides a suitable conclusion to a point-counterpoint analysis. Our children need outcomes, and they need them now. They need to leave high school prepared for work or college. If we want our children to be accountable, we need to be accountable ourselves. It is time to move forward. These new standards can be a very small first step to ensure all students have an equal chance to develop the skills and knowledge they need for personal success. How students learn, these standards, and how they are taught, is up to local districts, parents and teachers. Education in the United States has to start looking, and moving, forward. What we are doing now is not working. Common Core State Standards can help. We agree that “outcomes” should be used more frequently in this debate, since Common Core is in many ways recycled outcome-based education. But that’s a discussion for another forum. This “Conclusion” summarizes well the essential argument of the Common Core proponents – that what we’re doing in education isn’t working well, so we must try something – anything – that is offered to us amid lofty claims. Whether there is any evidence for those claims is irrelevant. Whether the scheme complies with the law and respects the constitutional rights of parents, localities, and states is similarly unimportant. The important thing is to stop debating and get on board the experts’ train. But Missourians will not roll over for this. These are our children you’re talking about, and we WILL be heard. http://dianeravitch.net/2013/07/05/robert-shepherd-common-core-requires-teaching-abstract-skills-not-content/ (emphasis in the original). If you start seeing these counterpoints appearing at your PTA meeting or classroom, you have an answer to their undocumented claims. Feel free to adopt/adapt for your state's use. Question. Why does the Common Core Initiative need a national school public relations organization to tell us how wonderful the standards are? This is a massive campaign with little to no research based facts as to its claims and the NSPRA is trying to sell education reform that bypassed legislators and voters. How DARE these groups question the adoption and implementation of a massive transformation of education "under the radar". The nerve of taxpayers and legislators! A final note is that planning and research for the communication strategies and tactics for implementation of the Common Core is provided by NSPRA with assistance of a planning grant from the Pearson Education Foundation. We appreciate their assistance in helping us to get this resource started.